Your loft or attic space is often a case of out of sight out of mind, which is why many pest infestations go undetected for so long. However, this gives them time to become increasingly worse and often present potential health risks, particularly in the case of rodent activity such as Hantavirus and Leptospirosis. 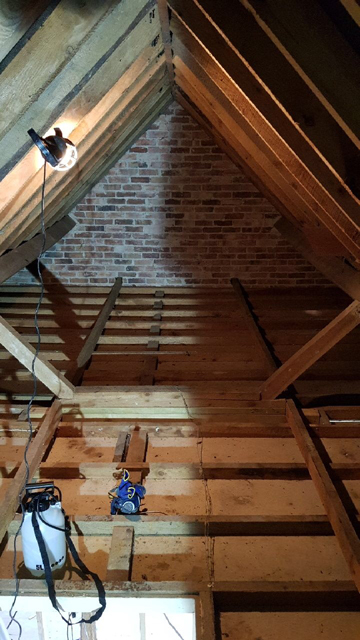 We deal with all manner of pest infestation and loft clearance jobs, ensuring that your loft or attic remains free of pests and health hazards. Are you in Dorset or West Hampshire and believe you may have a pest infestation in your loft? Don’t hesitate to contact us on 0800 1455762. What’s involved in our loft clearance service? We most frequently deal with lofts and attics which show signs of rodent activity. Before entering the space, our operators put on a full protective suit, mask and gloves to ensure their safety from potential diseases and chemicals that could be present in rat or mice droppings, such as Salmonella, E.coli, Hanavirus and Leptospira. Our team will then begin by coating the entire loft space with anti-bacterial spray before removing all items, furniture or otherwise. We then take a closer look at your insulation and make sure that all contaminated segments are removed. Once the space is clear, we will get rid of rodent droppings between joists using an industrial strength vacuum and finish off by reapplying anti-bacterial spray. You also don’t have to worry about the leftover waste when dealing with us, as we will remove all contaminated debris from your property and deliver it to a commercial skip for you. Do you require our loft clearance and pest control services? We don’t only handle rat and mice problems, but squirrels, birds and wasps too. Contact us on 0800 1455762. We also know that value for money is important for our customers, which is why we will beat any like for like quote that you bring us to ensure that you are getting the best loft clearance service in Dorset and West Hampshire for the best price. Contact us on 0800 1455762 to get started.